Nightcliff Community Bank Branch Jetty Artspace open prize is decided by community votes and available to all entries. Other categories provide for prizes as well, including a $350 Photography prize provided by the Enjoy Darwin website. Check the Nightcliff Community Bank website for details. 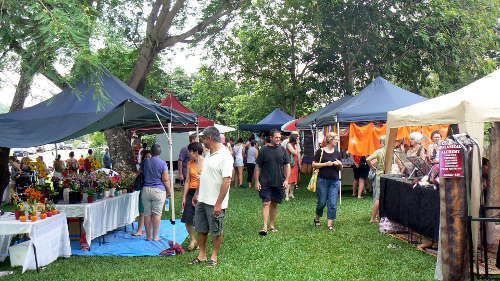 In the markets throughout Darwin Arts Crafts and Gifts are popular items, ranging from flower crafts, hand cut gem stones, jewelery, and stained glass to locally produced soaps and cosmetics. Many of these crafts are unique to the Darwin area, produced by local residents and Aboriginal Artists who have been located here for thousands of years. Other crafts are produced by people who follow the weather, heading north for the balmy months of the dry season, then moving south as the wet season approaches in late September or October. There are also many interesting crafts from South East Asian countries. New Malak Marketplace will open on Saturday 29th April 2018 and run each Saturday until the end of October. Come to Malak on Saturday evenings for live music, local farm produce and international variety food. Darwin Community Arts has moved to Travers St., Coconut Grove and provides a wide variety of opportunities to engage in community art including theatre, visual arts, digital art, film production, sewing, music and more. provides classes in a variety of mediums. There is also studio space and gallery space for exhibitions available. Territory artists and crafts people. If you live in the Territory here's an opportunity to tell everyone about your art work. We'd love to know what inspires you and how you developed your techniques. The maximum image size accepted is 800x600, please use your graphics program or a Web-based resizer, such as Picnik, to resize any photo larger than 800x600 pixels down to 800x600 before you upload.